I couldn’t resist sharing these Pudding Recipes for a Sweet Tooth with you. Just one look at these sumptuous puddings makes me want to both eat and make both of them. This first recipe is an incredibly indulgent dessert by James Martin, and it has been a favourite recipe at his restaurant for over 20 years. With a mixture of bourbon whisky, white chocolate and croissants, there is something for everyone in this one. 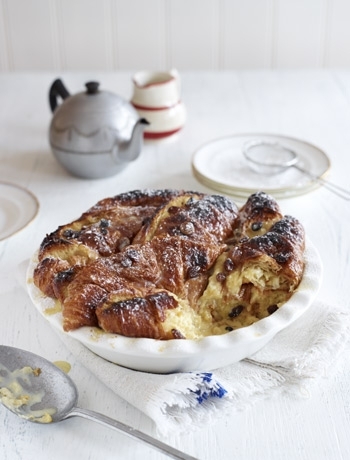 This Bourbon Croissant Butter Pudding Recipe is by James Martin, and he regards it as one of his signature dishes. Is an incredibly rich pudding - One big spoonful will be enough for me, but it sounds so gorgeous that I will have to try one next time we have friends around for a meal. There are days that you just fancy a spoonful of a really decadent pudding, and this one definitely fits that criteria. Enjoy! Warm the milk and cream with the seeds from the vanilla pod. Remove from the heat and stir in the white chocolate to melt it. Cut the croissants into slices and layer in a circular 25cm ovenproof dish. Soak the sultanas in bourbon until they start to puff up. Whisk together the eggs and egg yolks and beat in the caster sugar, add the warmed chocolate custard cream to the eggs then add the bourbon. Drizzle melted butter over the croissants and pour half the cream custard mixture over the top of the croissants. Sprinkle on the sultanas. Press the pudding down with your fingers so that the custard mixture is absorbed into the pudding. Top off with the rest of the custard mixture and bake for 20 minutes. To Serve - Dust with icing sugar and blow torch or quickly grill until crispy. Serve with ice-cream and cream. This next Pudding recipes for a Sweet Tooth is, yet again, by James Martin. I think he definitely is high up in the rankings of chefs who love extremely yummy puddings, so it comes as no surprise that this next recipe is entitled Ginger Cake and Poached Pears – not as totally indulgent as the Bourbon Croissant Butter Pudding recipe above, probably a lot healthier but definitely delicious. 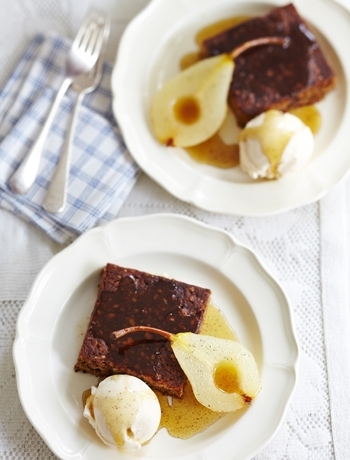 This Ginger Cake & Poached Pears recipe, from James Martin, sounds soothing and just perfect for a cold, damp winter afternoon or evening. The richness and earthiness of the Ginger Cake complements the freshness and spiciness of the Poached Pears and the warm Sauce, infused with cider. Preheat the oven to 180C/160CFan/Gas4. Grease and line a 20cm x 20cm tin. In a bowl, mix together the butter, sugar, ginger, mixed spice, nutmeg, egg, milk and treacle. Fold in the flour and oats. Pour into the tin and bake for 40 minutes. Whisk all the ingredients in a pan and warm through over a gentle heat. Gently poach them for 15 minutes in a pan with 500ml of water and the sugar, the vanilla pod plus seeds (scraped out) and lemon juice. Cut the cake into portions, drizzle over the sauce and serve with the poached pears. So here you have 2 more delicious recipes from James Martin. Purely a coincidence, but these Pudding Recipes for a Sweet Tooth made a perfect pair. One decadent, rich and incredibly indulgent, the other soothing and spicy. Both just the sort of food we want to eat on a dark, dank February evening. Well, at least Erik and I want to eat them, both of them! Or, maybe, just a spoonful of each!